Broiling Directions: Set oven control to broil. Spray broiler rack with cooking spray. Place coated chicken on rack in broiler pan. Broil with tops about 4 inches from heat 6 to 9 minutes, turning after 5 minutes, until juice of chicken is clear when center of thickest part is cut (at least 165°F). Let stand 5 minutes. Continue as directed in step 3. With just a few simple ingredients and 15 minutes of prep, you can have tasty grilled chicken tacos on the table. 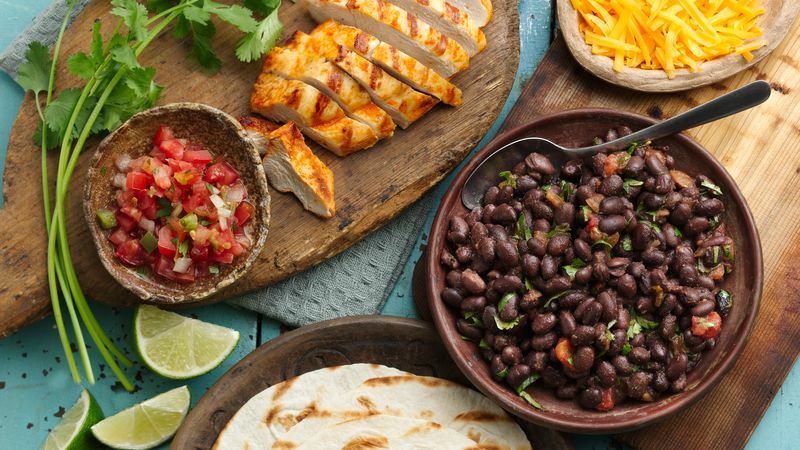 Although this recipe is fairly low-ingredient, it employs a clever trick for imparting flavor to sometimes bland ingredients: the black beans are warmed on the stove along with salsa and cilantro, and the chicken is tossed with taco seasoning and lime juice before grilling. If you’re looking for a lower-carb meal, this recipe would be just as delicious without the tortillas! As always, serve these with your favorite taco fixings, like sour cream, cheese, green onions or a squeeze of lime. If you’re looking for more taco recipes, we’ve got lots more where this one came from.